A Personalized Placement is the decision engine that ties together ads and in-app purchase (IAP) promotions, determining which format to serve based on player experience and impact to lifetime value (LTV). Each player receives the most meaningful engagements to maximize retention and revenue. Simply add IAP Promos to your rewarded or non-rewarded video ad Placements to increase their performance. Personalized Placements optimize toward LTV for retention and sustainable revenue. Unity calculates the LTV of your users by projecting their total potential value over an infinite amount of time. The data model analyzes many factors to predict the LTV of monetization content relative to your user, not just the bid price. These data points include, but are not limited to, the likelihood of the player returning to the app, and the likelihood of churn, app usage, historical ad preference, genre preference, and propensity for in-app purchases. The machine learning engine also benefits from being trained on all available data since the inception of the experiment. When a Personalized Placement requests content, its machine learning engine assigns an LTV score to each format, whether it’s an ad bid or IAP Promo. The format with the highest LTV score wins the impression. In the observation phase, Unity segments your users so that half receive optimized content, while the other half acts as a control group. This allows you to easily determine the optimization effects and make educated decisions about how to proceed. When you’ve observed significant results (typically after roughly one month of data), you’ll enter the scaling phase. During this phase, Unity maximizes the number of users experiencing optimization, in order to maximize your revenue. Because Personalized Placements work holistically to optimize your revenue, it’s important to ensure that your game’s overall economy and monetization strategy is healthy and effective to begin with. Unity’s machine learning model can dynamically adjust to your user’s preferences, to provide the best experience for each individual user. But if the underlying setup of your app or game is ineffective at driving monetization, the revenue lift will be smaller. This is especially important because the player’s journey, behavior, and creatives they experience directly impact the Personalized Placement’s valuations and choices. Read the pre-integration section if you’re new to monetization design strategy and looking for guidance on implementing an effective monetization system. Read the integration section when you’re confident in your monetization design strategy and ready to execute on it by implementing Personalized Placements in your game. Read the post-integration section when your game has been published long enough to observe and act on performance results to drive revenue higher. If you have any more questions, contact your Unity representative or review the FAQ. 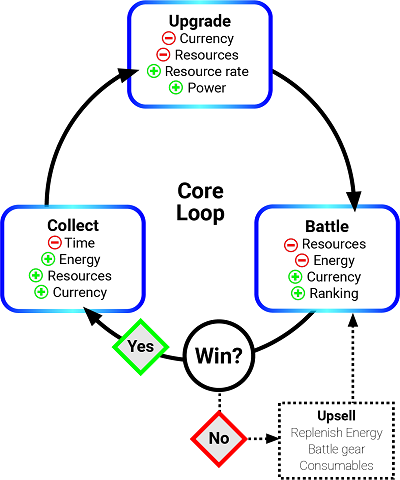 Identify your game’s core loop. Identify surfacing points that will entice players to enhance their experience. Identify player archetypes engaging with your game, and create Promos that target them. Your core loop is the fundamental sequence of activities a player follows and repeats throughout your game. These vary depending on the game and genre, but usually involve acquiring and spending resources to progress in the game. 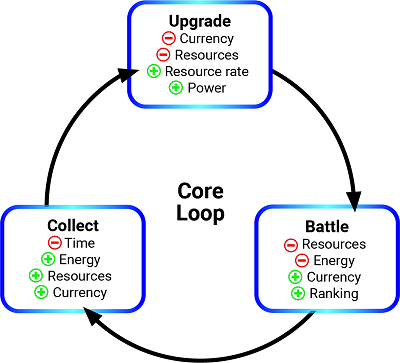 Your core loop is the mechanic that keeps players engaged with your content and incentivized to play. 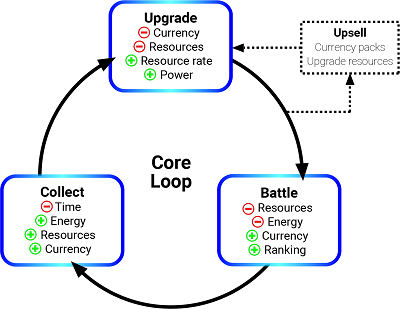 The steps between each activity in the core loop present the most fertile monetization opportunities. Natural breaks in gameplay or friction points occur between the phases of your core loop. These are surfacing points, and excellent locations to implement Placements because they present the player with choices or information without interrupting gameplay. When identifying these opportunities, remember that similar surfacing points can occur in multiple locations, so you can use a single Placement in multiple surfacing points throughout your game. For example, you can use the same Placement anywhere a player loses a life, levels up, or defeats a boss. You can further augment these surfacing points by implementing Standard Events that provide more context into in-game milestones of the player, which provides better data for machine learning-driven decisions (for more information, see section on Implementing Standard Events). These will ultimately be where you implement your Placements. Personalized Placements serve both ad and Promo content. Unity strongly recommends using rewarded ads in your implementation, and suggests reviewing the rewarded video best practices guide. Context is important. When considering these examples, think about what incentives make enticing rewards for each surfacing point if an ad wins the impression. Level transitions present a natural pause to display an ad or Promo without disrupting gameplay, and might be a good opportunity to reward or promote items that will help players with the upcoming challenge. Failing a challenge presents both a break in gameplay and a friction point, where the player might be interested in extra lives or power-ups that improve their chances of success on the next attempt. Leveling up often results in access to increased power or resources. This may present an opportunity to entice a non-paying player with a discounted purchase offer, or the option to watch an ad in exchange for a period of double rewards. Shops are resource sinks, and therefore good opportunities for rewarded Placements offering currency in exchange for watching an ad, or Promos for currency packs. The "completionist" player desires resources to collect and craft the best items. The "pitstop" player’s most valued resource is time, and therefore wants to speed things up and eliminate waiting. The "conqueror" player enjoys raiding, battling, and competition. They are typically willing to pay for power. Understanding your game’s audience helps identify what products they might desire. Remember, you don’t have to worry about matching the right player with the right offer, because the machine learning will do that for you. However, it’s important to account for every play style in your player base when choosing the types of Promos you’ll run. Completionist Focus on collectable or crafting items, and unique non-consumables such as vanity items or skins. Pitstop Focus on consumable items that speed up ability to progress in the game. Conqueror Focus on items that increase power, or vanity items that distinguish the player from their peers. Evergreen: Persistent content that is always available at a consistent price point. Non-payer: Single-use discounts only available to players who have not spent money in the game. Limited-time: Discounted items available to the entire player base, but only between specified dates. Note: You can configure non-payer and limited-time offers in the final step of the IAP Promo creation process (targeting and scheduling). Unity generally discourages including discounted items in Personalized Placement Promos, as it can skew the machine-learning data towards sale items, but non-payer and limited-time offers work well because the model excludes them from consideration when the player is ineligible for those offers. For more ideas on how to design effective Promo campaigns, see the IAP Promo monetization tips. With your monetization strategy set, you’re ready to implement Personalized Placements in your game. To get started, download the latest version of the Monetization framework for iOS. Personalized Placements require the Monetization SDK 3.0 or later. For information on downloading and importing the SDK, see documentation on iOS integration. To implement rewarded or non-rewarded ads in your Unity Project, you must initialize the Unity Monetization SDK, then implement scripts at your surfacing points that access and display content through Placement IDs. For a comprehensive guide, see documentation on Unity Ads integration for iOS. Unity also recommends reviewing the rewarded ads best practices guide as part of your implementation strategy. For more details, see documentation on Unity Ads mediation. If you have questions regarding compatibility with other mediators, please contact your Unity representative. The Monetization SDK allows you to take advantage of Personalized Placements using a custom purchasing integration, by implementing a purchasing adapter. This adapter is required for Unity to hook into the necessary machine learning data. For a complete guide on implementing a purchasing adapter, see documentation on Custom purchase integration for iOS. Standard Events track user experience and player behavior across your game. Implement a subset of game economy events so that Unity’s machine learning engine can optimize your Placement content. Game economy events help the Personalized Placements data model form a complete picture of each player’s preferences and actions in your game, then determine what actions to take accordingly. The following events help train Personalized Placements to know when it’s best to show a Promo. Call the onItemAcquired event when players acquire a resource in-game. Call the onItemSpent event when players consume a resource in-game. transactionId NSString (Optional) A unique identifier for the specific transaction that occurred. You can use this to group multiple events into a single transaction. Note: If the acquisitionType is premium (meaning the player purchased the commodity with real money), Unity recommends matching the transaction ID logged at the point of purchase with the one sent for onItemAcquired or onItemSpent, so the data model can easily associate the two as part of a single transaction. For more information, see documentation on Purchasing integration for iOS. itemId NSString (Required) A name or unique identifier for the spent or acquired item. transactionContext NSString (Required) The channel through which the item was spent or acquired. amount NSFloat (Required) The unit quantity of the spent or acquired item. balance NSFloat (Optional) The player’s new (post-transaction) quantity of the spent or acquired item. kUnityAnalyticsAcquisitionTypePremium indicates the item was purchased with real currency. kUnityAnalyticsAcquisitionTypeSoft indicates the item was acquired with virtual currency or resources. Note: Make sure you implement these events anywhere inventory transactions occur, including in your callback handler for rewarded ads. Call the onLevelFail event when players fail a level or die in-game. The data model can use this to show a Promo for a Product that will help them pass the level on the next attempt. Call the onLevelUp event when players progress or increase in power. // Add commodity to the player’s inventory. // Deduct commodity from the player’s inventory. // Respawn the player or display the Game Over menu. // Increase the player’s stats. Create Placements for your monetization surfacing points (as described in the pre-integration guide), or convert existing ones in your game. To create or convert a Personalized Placement, simply enable both Ads and IAP Promo content in the Content Settings menu. Unity recommends multiple Personalized Placements in your game, to give the player a consistent experience throughout. If you already have a live Placement that you wish to convert, simply add IAP Promo offers to your rewarded or non-rewarded video Placement. To do so, navigate to the desired Placement’s settings menu, then select Content Types and check IAP Promo. Make sure you associate your Promo campaigns with your active Placements. Provide your Unity representative with the Game ID and Personalized Placement ID(s) you wish to activate in your Project. Important: Be sure to revisit your mediation integration and update the Placement ID(s) you’re using. The final step is to configure Promos. Begin by importing the Product Catalog you created when implementing IAP to the Operate dashboard. Each Product requires an associated creative in order to be included with Promos. Select Products to include in the Promo. Select the Personalized Placements through which to promote the Promo. To verify that your Placements are configured to receive Promo content as well as ads, follow the testing steps detailed in the ads integration guide. If the Placement is configured properly, you will see a custom test ad indicating that Promos are enabled. As every game is unique, Unity strives to ensure that you’re comfortable with the performance of Personalized Placements in your game before optimizing the experience of your entire player base. This rollout consists of two phases: observation and scaling. When your Personalized Placements are live, Unity monitors phase one performance and enables an LTV Reporting tab on the Operate dashboard when statistically significant data is available. The report will appear on the left navigation bar of your Organization-level menu. This report lets you view how Personalized Placements impact your revenue and retention. It includes analytics for eCPM lift, revenue lift, and average revenue per daily active user (ARPDAU). Note: During the beta period, the LTV reporting period defaults to performance over the past 30 days, which allows for statistically significant results. Unity randomly assigns half of your users to an exposed group, while the other half constitutes a control group. The exposed users will experience content optimization, while the control group will not, to clearly demonstrate the difference in performance. As Unity collects data on the preferences of every user in the Unity network (even those who have just entered your game), you will generally see an immediate impact to your game. The observation phase typically lasts about a month, to generate statistically significant results. During this period, you will likely see a revenue impact within the first week of Placement conversion. However, to ensure solid data-driven decisions, Unity refrains from scaling optimized content to all users until the significance of that impact is clear. Note: The number of active Personalized Placements, size of your game, and complexity of its economy will heavily influence the actual length of the observation period. Unity recommends personalizing as many of your Placements as possible to improve the data sampling. Once you’ve accrued sufficient data, Unity adjusts the distribution of users to 90% exposed and 10% control. This allows Unity to maximize your revenue and still demonstrate the effect of optimization on your users. After this change, your revenue lift will be projected by normalizing the data of both groups, so Unity can compare the results from two differently-sized experiment populations correctly. During the beta, your account manager will work closely with you to handle the transition between phases. Your dashboards will change automatically, adjusting to the new optimization settings. Note: If you use ads mediation, Unity is working to allow your mediation platform (e.g. Admob and Mopub) to correctly utilize the additional revenue you receive from our optimization in their autoranking of your meditation waterfall. This will be available in the near future, and allow you to correctly rank Unity against other monetization partners automatically.